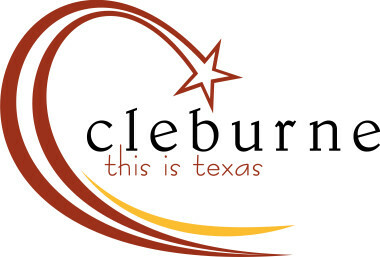 If you find yourself in Cleburne, Texas, for the weekend, you’re in luck. This little town is home to quirky museums, charming shopping districts and architectural marvels. The city is named after the late Confederate General Patrick Cleburne who was so successful in his military defeats that he was nicknamed “Stonewall of the West.” While you may not complete everything on this guide’s list, it’s definitely worth a try. Here is your 36-hour weekend guide to the best-kept secret in Texas. 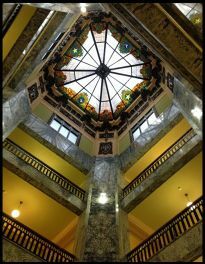 Begin your adventure by going on an architectural tour at Johnson County Courthouse along Lake Pat Cleburne. Notice the prairie-style architecture—an iconic design linked to architecture greats like Frank Lloyd Wright and Louis Sullivan. Completed in 1913, this is the sixth and final courthouse to stand at this location. Inside you’ll see the interior the four-story clock tower with its beautiful skylight, framed in stained glass. 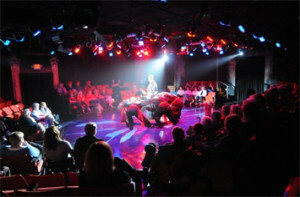 Next stop, the Plaza Theatre Company on Main Street. Its two-story brick architecture reveals intricate details of “Old Texas.” On Friday evenings, chances are you’ll be able to catch classic performance pieces, from “The Secret Garden,” to “Mary Poppins,” to “You’re a Good Man Charlie Brown.” Many of the theater’s plays are kid-friendly, allowing families to enjoy classic stories passed on for generations. 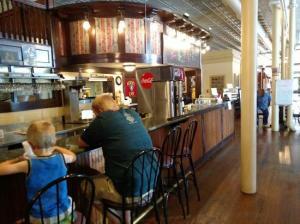 Start your day with a bit of true small-town Texas living with breakfast at R&K Cafe II. The restaurant may not look like much from the outside, but a menu of hearty chicken fried steaks and a staff that imbues true Southern hospitality make the experience well worth it. After fresh eggs, pancakes, grits and bacon, it’s time to embark on your next adventure. Cleburne has a handful of museums reflecting its heritage and history. 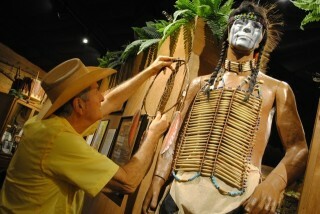 Browse through the exhibits at Chisholm Trail Museum and Big Bear Native American Museum to see artifacts of teepees, headdress and weapons wielded by the indigenous people. The artifacts are so highly desirable that The Smithsonian competed to acquire the pieces before Johnson County Heritage Foundation closed in on the sales. While there, explore the outdoor museum where several replica buildings are set up to show visitors what life looked like back in the Wild West. You will come across a blacksmith shop, Wardville Courthouse, one-room schoolhouse, trading post and more. Staff in period attire will give live demonstrations, such as making horseshoes and wood whittling. Hit one more museum before your lunch break: Gone With the Wind Remembered Museum on Second Street. Museum owner Vicky Lynn Rogers was so obsessed with the story penned by Margaret Mitchell that she collected every Gone With the Wind memorabilia item she could find over the course of 30 years. Her collection got so large that people suggested she open a museum. Hence, the birth of Gone With the Wind Remembered. Browse through thousands of rare and hard-to-find items including over 600 dolls of Scarlett O’Hara, an armchair used in the film, and original props from the set. You don’t have to be a diehard fan of this Civil War romance to appreciate the collection. As lunchtime rolls around, there are several places to choose from in Cleburne. Get your Texan comfort foods at Heroes Cafe located in a saloon-like building where you can enjoy tortilla soup or bite into chili cheese jalapeno burgers. Looking for something more gourmet? Visit the charming Purple Turnip, serving quiches, salmon burgers, and grilled fish. For those with a hankering for Mexican food, you’re in for a real treat: Barrera’s will satisfy that craving with a wide range of flavors from south of the border. And, for something truly unusual, try Burger Bar. Located in a 10x14 building, (yes, you read that right), the entire restaurant is the size of a walk-in closet. As you can see, not everything in Texas is bigger, but don’t let its size fool you. This place is longstanding (almost 70 years) and the pride and joy of Cleburne’s hamburger connoisseurs. For the rest of your day in Cleburne, do some shoppin. You can find the latest designer brands from popular chains at Wright Plaza. Lovers of all things vintage will want to stop by Bus Depot Antiques and Market (you will recognize it by the mural of a bus, on the side of the building). Expect to find vintage globes, typewriters and Victorian jewelry at bargain prices, and make your friends jealous back at home. Other shops of note include The Castle Collection and Shoppe on the Corner. When night falls, Songbird Live! is where the action is on a Saturday evening. It’s a fun spot to show off your best dance moves—a perfect way to end the day. On your final day in Cleburne, get a true Texan send-off at Susannah’s Homestyle Cooking. It’s like having lunch at grandma’s, with healthy servings of pork chops, chicken fried breast, and chicken and dumplings. The restaurant is also known for its daily specials, like discounted catfish fillet or steak fingers.